Creating a PMP study plan can be very similar to creating a project management plan. When you decide to get PMP certified, you should treat obtaining your certification as a mini-project. There are five process groups in the PMBOK guide, and you should have a plan to tackle each stage of your “project”. Initiating: Commit to getting PMP certified and understand why you want to be certified. Planning: Create a plan on how you will get certified based on your learning style and availability. Executing: Carry out your study plan. Monitoring & Controlling: Check in with yourself to ensure that you are on schedule. If you are behind schedule, adjust your study plans. Closing: Celebrate getting your PMP credentials. 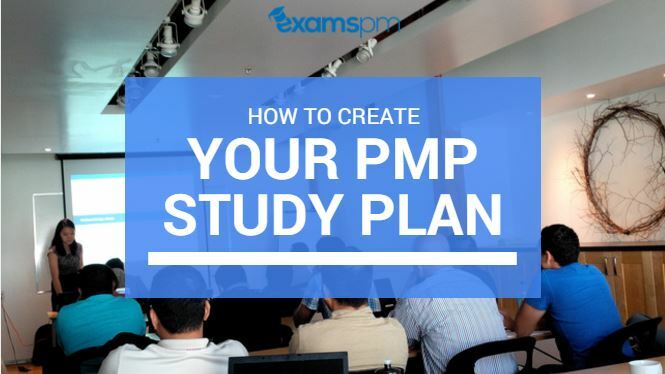 In this article, we will give you the step-by-step instructions on how to create your own PMP study plan. What is the PMP exam and how does it work? The Project Management Professional (PMP) certification is the world’s leading certification on project management. Increasingly, employers are screening candidates for the PMP credential before they are hired for project management jobs. The goal of this certification is to teach you a framework to successfully manage projects of any size in any industry. When you have the PMP credentials on your resume, your recruiter is reassured that you know the standards. Before you start your exam, the Prometrics testing software will generate 200 random questions from their database and assign them to you. You can be sitting beside two other people who are also taking their PMP certification, and all three of you can receive completely different exams. Although there are 200 multiple choice questions, only 175 questions are marked. However, you will not know which questions are not marked so you must answer every question as if it is marked. How do I get a free copy of the PMBOK? Tip: Always make sure you are studying the latest version of the PMBOK. Since 2014, PMI stopped releasing the passing score to the PMP exam. However, when they last released the passing score, it was 61%. A few years before that, the passing score was 68%. Although no one knows what the passing score is for sure, our best guess is that it is still between 61-68%. A critical portion of your PMP study plan is doing practice questions. In fact, you should do 2000-3000 before your actual exam. When you are doing your practice exam, you should be aiming for 80%+ on your first attempt in order to leave yourself with a margin of safety on your actual exam. Further reading: What is the passing score for PMP? What is the best way to study for the PMP exam? No PMP study plan is complete without practice questions! In fact, the best way to study for the PMP exam would depend upon your learning style and time frame. There is no right or wrong answers. When you are creating your PMP study plan, you can attend in-person classes, online classes and read books. You can do a combination of these three study methods. Be sure to sign up for a free 1 hour class with ExamsPM below! A common mistake that PMP candidates make is that they try to read or watch everything they can get their hands on. This practice is unnecessary and often a waste of time. Your goal for taking PMP certification courses or reading books is to understand project management concepts in the PMBOK. You want to accomplish this goal as quickly as possible. The study materials between these different sources are probably very similar. For example, there are only so many ways you can explain what a WBS (work breakdown structure) is. Reading or watching redundant information is not going to help you get closer to being PMP certified. We recommend that you purchase enough preparation material to help you understand all the concepts. You do not need more than 1 – 3 different courses or books. You may think that you can rely on your real life project management experiences to get PMP certified. Unfortunately, PMI has established its own standards for managing projects. Without studying the concepts and terminologies, you will not be able to pass. The PMP exam is based on the PMBOK guide. Thus, understanding the contents in this guide is crucial. Reading the PMBOK can be a daunting task for many candidates. It’s a 600+ page book filled with acronyms and jargons. It’s easy to get lost. In fact, many candidates often tell us that they feel like they’ve read everything and nothing at the same time. The important thing is to understand the structure, or “skeleton”, of the PMBOK. Once you understand the logic behind the PMBOK, it becomes much easier to understand. If you want to understand the structure of the PMBOK and the ITTOs within it, sign up for our free class. There is no need to memorize the PMBOK guide. If you try, you may drive yourself crazy. There’s simply way too much information. Instead of memorizing the PMBOK, seek to understand how the different components link together to complete a project. Although we do not recommend memorizing the PMBOK, we do recommend memorizing the process chart, or the “skeleton” of the PMBOK. Here’s an article on how you can memorize the process chart faster. Tip: You will get a free copy of the PMBOK with your PMP membership. You may consider adding this guide into your PMP study plan. The next step in creating your PMP study plan is to set timelines for yourself. In general, it is better to have a shorter timeframe rather than a long one. When you give yourself a very long time to get certified, you tend to forget the material you studied earlier. Additionally, when you give yourself a shorter time frame, you are more focused and there is less room for procrastination. You want to make studying a daily habit. These incremental improvements will add up. Studies also show that it is more effective to study on regular basis as opposed to cramming days before your exam. At the end of every week, recap everything you’ve learned and set goals for the following week. Before you know it, you will have all the lectures and practice questions completed. You can always find time for studying. If you are at the gym, listen to a lecture. If you are waiting in lines, do a few practice questions. You can always find ways to fit more into your day. Remember, what gets measured gets done. Tip: When you are creating the schedule for your PMP study plan, try to pace yourself evenly. Study one knowledge area per week. There are many project management jargons, terms, and acronyms instead the PMBOK. You may have seen some of them on your job. You may have experienced some of the concepts without knowing the name of them. However, you probably haven’t been exposed to all the vocabulary in the PMBOK. To get familiar with “PMI-ism”, you can do daily vocabulary drills. Add new vocabulary each day and review the old ones from previous days. You can make a list of terms that you need to know and test yourself, or you can purchase online PMP flashcards. One common misconception that PMP candidates have is that they can pass the PMP based on their decades of project management work experience. This cannot be further from the truth. PMI has established their own best practices for project management, and the only way to understand them is through studying the PMBOK guide. Another misconception that candidates have is that they believe they can pass the PMP after they’ve read the PMBOK once or twice. PMI has a very unique style of wording multiple choice questions, and the only way you will get comfortable with this style is through doing a lot of practice questions. As you do practice questions, make sure you are analyzing which knowledge areas or process groups you are weak on. You may want to go back to those areas and re-watch the lectures. There has never been a candidate who successfully passed the PMP without doing practice questions. At ExamsPM, we offer 200 free practice questions. If you haven’t checked it out, download them below. Additionally, read this article to learn the 9 strategies that will help you answer PMP questions correctly. Part of your PMP study plan is setting out your study schedule. Studying for your PMP exam is all about consistency. Once you know what you need to learn, you need to set a schedule to complete all the tasks. It is better to study consistently for a short period of time than to binge study over the course of a year. When you give yourself a long timeline, you may forget material that you studied earlier. Some of our successful students set daily study reminders on their phones. Small actions taken consistently will make a big impact. A common excuse we hear often is: “But I don’t have time to study!” Yes, you do. You can always “squeeze” time out of your day to fit in half an hour or an hour of studying. When you are waiting in line, pull out your phone and do a few practice questions. When you are commuting to work, listen to a lecture instead of music. One of the best ways to learn is to create your own study notes. As your reading or watching PMP prep material, make your own study notes to reinforce what you have learned. When you write things down, you add an extra dimension to your memorial. Another benefit for creating your own study notes is that you will be creating your own condensed version of the PMBOK. Instead of reading or re-reading the PMBOK right before your exam, you have summary notes to remind you of all the key points. Creating study notes can also help you determine what kinds of information you want to include on your “brain dump”. Find someone who is also in the process of getting PMP certified and pair up with him/her. Share your study plans with your partner and tell him/her to hold you accountable. For added accountability, make bets with your study partner. For example, if I don’t finish watching Project Integration Management by Friday night, I owe you $100. Studies show that when you make a goal public and attach negative consequences for not obtaining the goal, you are much more likely to reach your goal. Another way to ensure accountability is to book your exam date in advance. When you registered and paid, you’ve set a deadline for yourself to take the exam. When you are trying to accomplish any goal, it is important to surround yourself with a supportive community. You should consider adding going to project management events or PMP study groups as part of your PMP study plan. Studying for the PMP can be a lonely process. Find project management communities online or offline and other applicants who are also going through the same process. There are thousands of applicants who successfully pass the PMP certification every month. Don’t try to reinvent the wheel. Learn what strategies work and adopt them. Be aware of the pitfalls and avoid them. Before you begin your project, you may review lessons learned from your company’s organizational process assets. Similarly, before you begin studying for your PMP, you should review lessons learned from past applicants. Have you recently passed your PMP? Share your story with us by emailing us at support@examspm.com. Previous Post PMP Study Notes PDF (PMBOK 6th Edition) Next Post How many PMBOK knowledge areas are there?